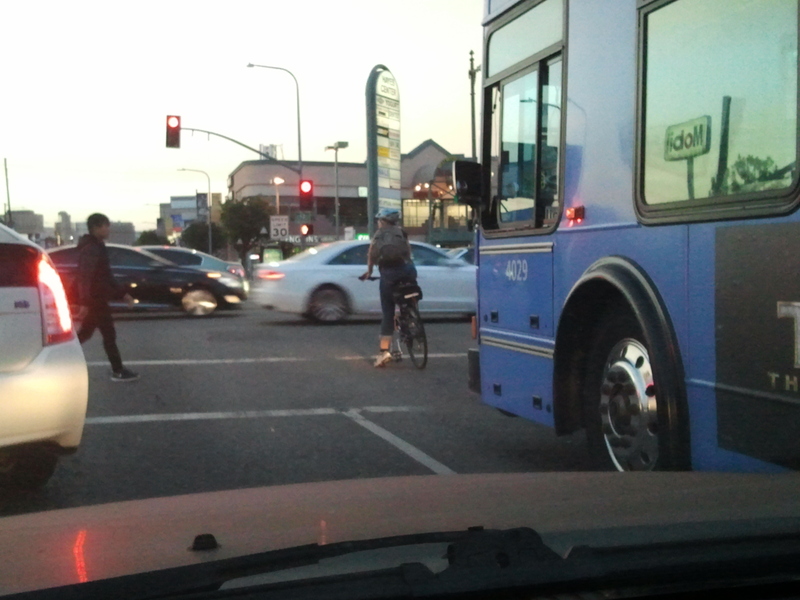 There’s no room for bikes on Westwood Blvd, but many bicyclists are forced to ride there anyway. Last week, CD5 Councilmember Paul Koretz announced that he was opposed to any efforts to install a bike lane on Westwood Boulevard, despite earlier promises to study the issue. Westwood resident Calla Weimer has been an insightful and outspoken dissenter to the local Homeowner Association’s opposition to the bike lanes. Today she voices her reaction to Koretz’ backpedalling, as bike lane supporters prepare to storm today’s city council meeting in protest of the decision. An urban transportation system must function as a network. What are the implications for that network when the leadership of a neighborhood homeowners group can influence their city councilmember to dictate to LADOT that a six block stretch of roadway should not even be the object of study for bike lanes? That is exactly what has happened with the segment of Westwood Blvd that runs between Santa Monica and Pico. In response to pressure from the Westwood South of Santa Monica Homeowners’ Association (WSSM HOA), Councilmember Koretz declared in a letter dated November 13, 2013 that he “will not be supporting the exploration of the floating bike lane concept nor other options for bike lanes along this crucial commercial corridor.” This reverses his previous authorization for LADOT to proceed with study of the floating bike lane design, as announced to the WSSM HOA at its annual meeting in June. Bike riders forced to take the lane at rush hour. As dangerous as this segment of Westwood Blvd is for cyclists, you would think transportation planners would give serious consideration to any proposal that could improve safety. In 2011, six cyclists were involved in collisions with motor vehicles along this 0.8 mile stretch. Westwood Blvd is already a major cycling corridor leading to a terminus at UCLA, and its importance for cycling will soon get a boost with the opening of an Expo Line station right on Westwood Blvd little more than two miles from the university campus. The station will offer no car parking, so the bicycle connection is fundamental to its purpose. All the more reason, you would think, that planners should focus on this stretch of roadway now, with an eye to how it integrates into transit upgrades. In halting the study, Councilmember Koretz gave reasons that echoed concerns voiced by the WSSM HOA leadership. He worries that the floating bike lane design is “far too confusing”. The design has in fact already been implemented and judged successful in San Francisco. I hope we can reject any suggestion that Angelenos are more prone to confusion than our neighbors to the north. The Councilmember further cited his “realization that even this concept would have substantial negative impacts on the movement of traffic, and would cause significant changes for parking conditions along this corridor.” The impact on parking is clear enough – the only change is that parking during the evening peak shifts from the west side of the street to the east side. While east side businesses may appreciate this parking windfall, they have long managed without it, and their west side counterparts should be presumed no less adaptive. Many businesses on the street close by 5pm anyway. As for “substantial negative impacts on the movement of traffic”, this is precisely the kind of assessment that should be taken on by the professionals at LADOT, not left to the “realization” of a casual observer eyeballing the street (even if that observer is a councilmember). I am writing to inform you that our office has given a green light to staff for the Departments of Transportation and Planning to begin the process of analyzing the model of floating bike lanes for Westwood Blvd. south of Santa Monica. This process will likely take at least a few months before we have something evaluate. At that point we can discuss next steps, including a discussion with your HOA committee. It would be premature at this time to do any active community outreach, since we don’t yet have an analysis of this option as it may apply to Westwood Blvd. The Councilmember has not made any commitments at this time regarding the floating bike lane plan and he is waiting as I hope that each of you will to see what the analysis will show. Large truck squeezes past cyclist in same lane; that can’t feel very comfortable. Those in favor of bike lanes waited patiently, as instructed, even as the WSSM HOA leadership put out a stream of bike lane denunciations. Under pressure from the naysayers, the Councilmember then reneged on his promise of a study and community discussion. On a citywide scale, LA planners are making strides in expanding transit options beyond the automobile and creating a more liveable streetscape. Yet our bikeway system, while growing, remains highly fragmented and new rail lines being put in place will leave many riders short of their destinations by that last mile or two. To see the agenda through will require overarching vision and coordination. Neighborhood voices must be heard as part of the process. But the discussion should be well informed, and it is incumbent on our Departments of Planning and Transportation to provide the needed information and for our city councilmembers to respect the job that planning officials are charged with doing. I hope we’ve learned not to trust Councilman Koretz’s lying staffers when they tell us all will be well if we just wait to have our voices heard. Looking at the bike plan, there are no other alternative bike lane corridors planned for the Expo-to-UCLA zone. Westwood was our last chance, and now it’s gone. Councilman Koretz has failed. In the vacuum of leadership from Councilman Koretz and his staff, can the bike community direct its energy to other corridors? Is there any chance of Sepulveda or Overland? 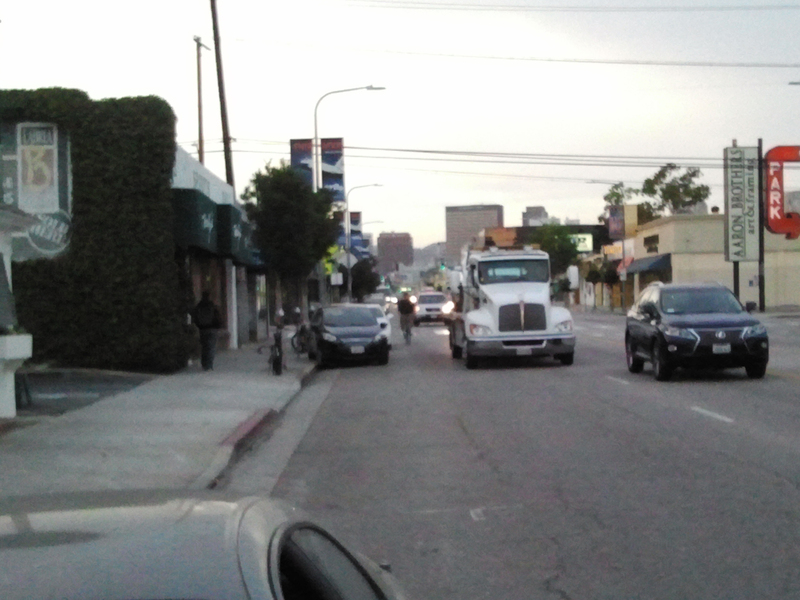 Veteran and adjacent streets are slated for some bike-friendly streets following a tortuous path between Expo and UCLA, but perhaps there is a better route in the absence of Westwood. I think weekly group rides up and down Westwood blvd during rush hour are in order. Even just a half dozen people lawfully taking the right lane and riding the stretch plastered with signs pointing to a website dedicated to this issue could be effective. In the long run proper bike infrastructure is going to reduce traffic for everyone. The same thing happened with 4th Street in LA… Sure would’ve been nice to have those bike signals at Rosewood and Highland that the Hancock Park Homeowners Association killed. Koretz suggested studying Sepulveda as an alternative to bike lanes on Westwood. However, it’s significantly out of the way from anyone riding from Expo to UCLA, and as dangerous and unpleasant as Westwood is, I think Sepulveda is worse. I second the suggestion of rush hour rides, but something along the lines of a tweed ride, but toned down. You want people to think you are professors riding home from class with books and groceries in your panniers and baskets. Great pictures. I think visuals are critical to make the case for a change. I ride a bicycle everyday and I don’t think we need Bike Lanes. 99% of drivers pass with seven to ten feet of clearance. Cyclists should instead use digital video cameras, mounted on their helmets or handlebars. It would be more cost effective, and traffic could just proceed normally when no bikes are present. Use the video to target the offenders , rather than bottleneck traffic for everybody. Hi-Def digital cameras can read plate numbers, which can be used as evidence in court . Call me and let me know when you’ve got a video camera , until then , this is a waste of time. Lol, you funny James. I heard Portland, Davis, Boulder, San Francisco, etc. all achieved high rates of cycling by giving cyclists cameras… NOT! A camera does nothing to prevent a collision, infrastructure does. Cost effective would be designing streets so that people are encouraged to make the smart decision to use non-polluting modes of travel– a handlebar mounted camera isn’t gonna convince anyone to hop on a bike. Call me when you think of a proven way to improve safety and increase the number of people biking. Oddly, James, I ride with a video camera every time I get on my bike. Yet it is useless for targeting offenders for traffic violations, as the law requires police to actually witness a violation before writing a ticket. Yes, it can be used to document more serious violations, but no cop is going to write a ticket based on video unless someone was seriously injured or some other, more serious crime occurred. And on what planet do you live on where the overwhelming majority of drivers pass with 7 to 10 feet of clearance? I want to move there. This sort of “war or cars” mentality is why many people will be scared of supporting bike infrastructure. I hope your proposal to create havoc fails miserably. That video will be great to play for the investigators after you’ve been killed by a car, but as an incentive to bike… I don’t think so. I responded to his post elsewhere. Basically, the reconfiguration of road geometry to includes these lanes generally tends to increase the number of people who ride a bike. An understanding of what would compel the next tier of people to ride a bike is fundamental to this effort by many to rally for the reinstatement of the bike study on Westwood. Yes, it would make current riders feel more confident on Westwood; but it would also induce the next tier of “non-riders” to start riding, especially after Expo opens. You are right, it is a war. But not against cars per se, but against the decades of myopic city planning that has created the worst traffic congestion in the country. My plan, isn’t to create havoc, but to show the regular commuters, what they can expect once the train station is operational… the bikes are coming, you can either plan for it, and make it safer and easier for everyone, or you can ignore it and increase death, injury and congestion. We have plenty of road space to put in safe effective alternatives to private cars which will ultimately reduce congestion, but we need visionary leadership to make it happen. When a single member of city government under pressure by a minuscule segment of the population is able to derail a study…not even a project, but a study of the feasibility of some bike lanes on a popular street, and thus jeopardize the inter-connectivity of a safe cycling network for an entire region we have a problem, and going to war is warranted to fight this sort of idiocy. On a personal level, having bike lanes on Westwood blvd really doesn’t matter much to me, since I ride in traffic daily without bike lanes for most of my travels and it suits me just fine. My issue, is that I see, far too many people on bikes hugging the gutter as cars speed past dangerously, illegally close. These people, and the ones too intimidated to ride are the ones who need dedicated lanes. A more complete network of safe convenient bike routes will allow more people to ditch their cars and will mean less traffic for everyone. I like this concept. I will dust off the old blazer and am in. This is the method I use currently. However, the cameras don’t stop people from being jack asses. Sure I can take them to court under L.A.’s anti-harrassment law, but who has time to do that? Plus even if I get their plates, If I don’t get their face, it is pointless. The camera is not going to get my wife and daughter riding on the street either, so it really is only a solution for the people who are already riding. The hypocrisy was very palpable… I ride 4th Street every day to work wish there would be more action on this in addition to this Westwood project. Haven’t heard a peep about this project in a minute and I would LOVE to avoid the daily game of Frogger I play on Highland Blvd. James Donohue see Sirinya Tritipeskul Matute below: The result of repainting our streets will be a marked increase in the use of bicycles for transportation in our city. More bicycles is less cars. Less cars is a calmer safer city that will engender more bicycles. A positive feedback loop. I can’t affirm confidently at this point that we will see fewer cars on our roads through the increased use of bikes; it is possible that we will see additional people using our streets. You know how the opening of a new lane on the freeway unleashes latent demand? I suspect that we could see the same here. And I don’t know if I think that is entirely bad. I would want to see more people coming out on their bikes to complete a trip they skipped before. That confers so many benefits. The one easiest (perhaps?) to calculate would be economic. But we might also see how it can be liberating as well for so many people. I consider all the people I don’t see because it’s too hard to reach them (stressful driving trip; long bus trip; unpleasant/lengthy/risky bike trip). I think we’re on the same page, though. Disclaimer: I am a Gulf War Veteran. I ride with lots of red and amber marker lights on my bike, day and night. I wear a Reflective Vest. I don’t race. I watch my rear-view mirrors. If I see anything funny behind me, I stop, dismount, and start taking pictures. I have flags on fiberglass poles on my bike. Everybody thinks I’m a Police Officer (I was Military Police during the first Gulf War, and I help the Auxiliary Police direct traffic , but I’m not on the Police Payroll. ) I have a digital camera on a tripod, in the handlebar basket, so the camera can be aimed independently of the handlebars. The city has traffic cameras on poles with flash, like 40 of them. I have a flashing headlight on my helmet, which everyone thinks is a camera, but the real cameras are elsewhere. I live on the North Shore of Long Island, out here on the East Coast. We have Mass Transit, in the form of the Long Island Rail Road (LIRR), and Nassau Inter-County Express (NICE Bus). In the city of Glen Cove, the hispanic population makes great use of bicycles, though most ride on the sidewalks. Glen Street was put on a “Road Diet” a few years ago, which narrowed the road, but made it safer, go figure. I may have started the photography thing, but notice that instead of other cyclists installing cameras, the city has installed the cameras on poles at every major intersection. Now the question is about civil rights, the city may take heat for using cameras, but I as an individual certainly have the right to have a camera on my handlebars. My a advice is to watch the rear-view mirror, and stop, dismount , and start taking pictures when anything starts to happen. Typically, any car that is approaching from the cyclists rear, and has come within 200 feet, without taking any precautions , such as slowing down, or moving to the left lane. We don’t need *everyone* to have a camera on their bikes, just a few volunteer gulf war veterans. I find the caption to photo #2 rather amusing, since bicycle drivers WANT to control lanes; it’s not some kind of equivalent to a transportation hair shirt that we’re forced to do. It’s what traffic cycling instructors teach cyclists, so they don’t get squeezed like the edge rider in photo #3. Has anyone proposed sharrows and BMUFL signs as an alternative to door zone bike lanes? A “bike lanes or nothing” approach is simply a false dichotomy that ignores traffic controls, like sharrows and BMUFL signs, that can promote lane control without removing travel lanes or on-street parking, which often makes the politics of adoption easier in areas with residents hostile to bike lane development. When I take the lane, the overwhelming majority of drivers move entirely into the next lane to pass me. 6-8 feet of clearance is pretty normal for me. I wouldn’t advise the “stop and dismount” method. A rear mounted camera recording the action is enough. If you dismount then you are a pedestrian in the street and the law is not on your side at that point. At the risk of reigniting a VC-vs.-infrastructure flame war, I’d like to point out that a great number of people who currently ride bicycles in Los Angeles (a majority, in my un-scientific opinion) are not “bicycle drivers,” but rather people who have no other affordable means of travel, have little to no traffic skills education, don’t care a whit about the right of bicyclists to equal access to the roadway, are scared to death of automobile traffic, and ride most often on the sidewalk at an 8-12 mph pace. Also, even many LCIs and others with advanced traffic skills would rather not be put into situations where we’re controlling the lane on busy streets and will only do so when the alternatives are significantly slower, indirect, or just plain nonexistent — myself included. Most current bicyclists do not prefer to ride VC on a street like Westwood; this preference is unlikely to change. Hello from Seville, Spain. Once this city put in a network of physically separated bike lanes, cycling has skyrocketed and accidents have gone down. We’re never going back. CD5 Candidate Jesse Creed Calls for Safety Improvements for Westwood Blvd. By calling for safety improvements for Westwood Blvd., city council challenger Jesse Creed is drawing a clear distinction between himself and anti-bike-lane incumbent Paul Koretz.